In Chicago, the place to be in the summer is at the beautiful parks and lakefront of the Chicago Park District. Millions of people visit Grant Park and the lakefront each summer to enjoy some of the premier events in the country! Now, a first-of-its-kind advertising opportunity is hitting Chicago’s lakefront this summer! The Chicago Park District has partnered with Chicago-based AdTraction Media to create the first textured surface advertising plan in the country. AdTraction has created a unique solution to utilize an adhesive product that forms to concrete or blacktop. The product is tested to perform in extreme outdoor weather conditions while maintaining a high slip resistant surface and a quality appearance. 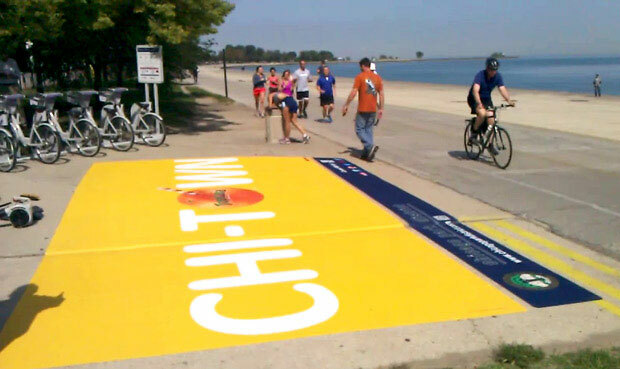 In 2012, AdTraction’s textured surface displays for Gatorade, Tropicana and Nike were seamlessly integrated into lakefront activities where walkers, runners and cyclists traversed safely over them. This summer, there are 55 individual, 12’x24′ (288 sqft), surface advertising locations along Chicago’s lakefront available; locations include beaches at North Avenue, Oak Street and Ohio Street, the harbors, Northernly Island, Museum Campus and Buckingham Fountain. Each of the locations will cycle a display for 28 days, 6 cycles throughout the summer; a total offering of 330 total sponsorship opportunities. Chicago’s strong cultural, commerce, sports and entertainment venues boast unparalled media exposure opportunities. By taking a stroll along Chicago’s beautiful lakefront, Chicagoans and visitors marvel in the beautiful scenery that the City by the Lake provides. Eye-popping exposure at some of the city’s top events, such as the Taste of Chicago, Chicago Air and Water Show, Lollapalooza, Chicago Jazz Festival and the Chicago Marathon, can put brands in front over 8M visitors to the area! To learn more, visit AdTraction in the DOmedia marketplace and request a quote!